My Steel Wheeler friend Tim kindly invited Alfie, Richard, and I to ride for a few days from his home in Sigale in the deep south French Alps. 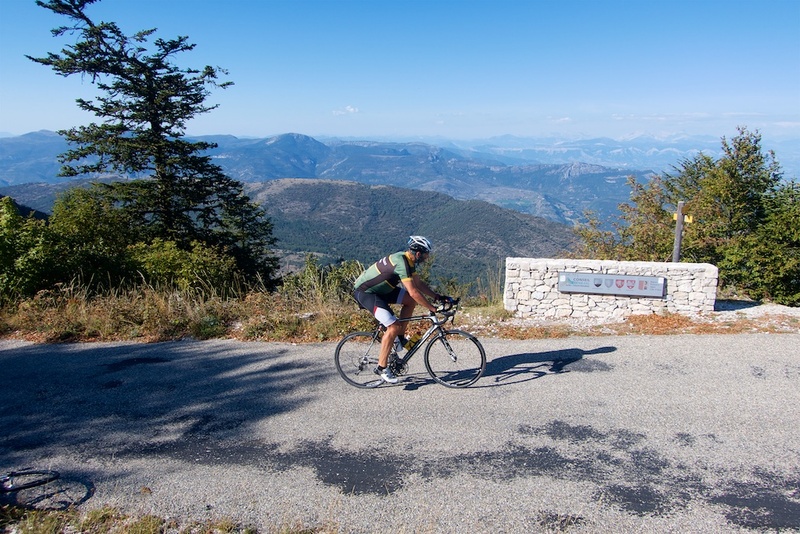 It’s a long drive from Geneva, so we decided to stop along the way to cycle for the first time to Montagne de Lure in the French department of Alpes-de-Haute-Provence. 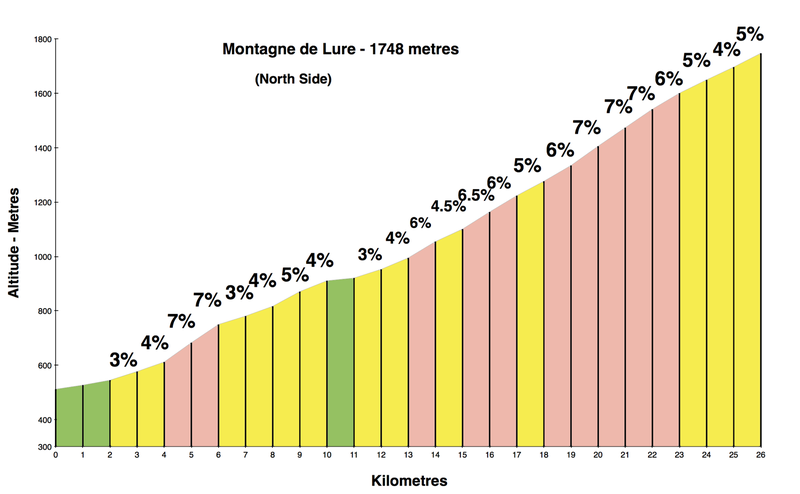 Montagne de Lure appeared in both the 2009 and 2013 edition of Paris-Nice. 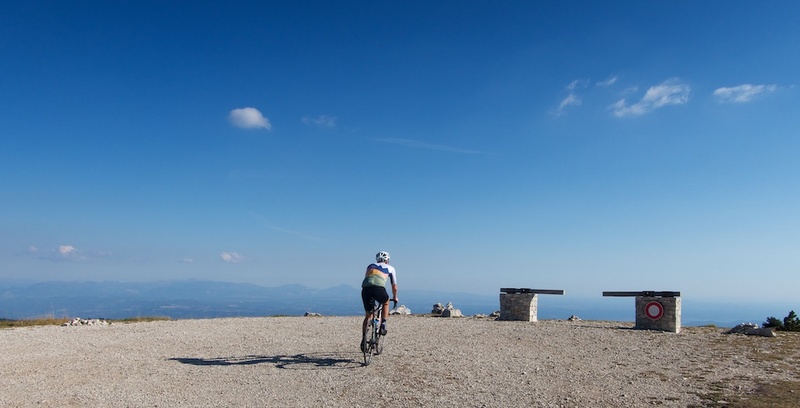 The south-west side is better known by cyclists exploring the Provence “wilderness” beyond Ventoux. 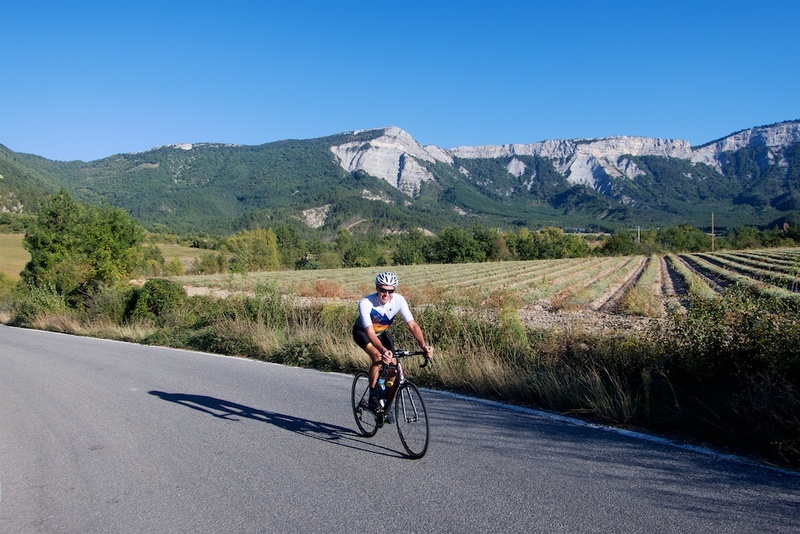 However, we would be climbing the north side starting near Sisteron. (feel free to comment if you’ve ever ridden the SW side). The road starts off with very promising views of the mountains above. The route soon enters a forest and we wouldn’t see another building until the summit. It’s a very quiet road, few hairpins, but never straight. Squiggly. Autumn weather and a north-side road meant we were in constant shade for a good 20 kilometres. I’d bet the other side is more interesting: the road here is safe, few views, but very peaceful. 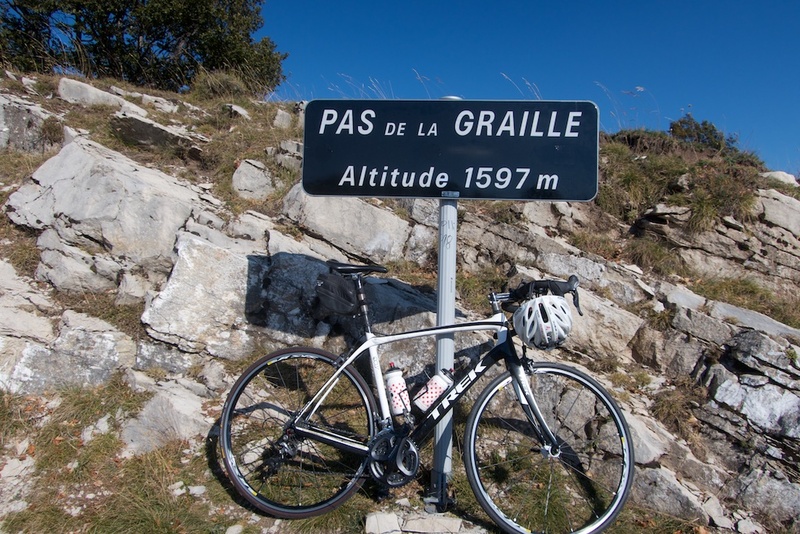 It gets more interesting perhaps three kilometres from the summit at a geographic col: Pas de la Graille 1597 metres. Here the views improve and the summit is in sight. 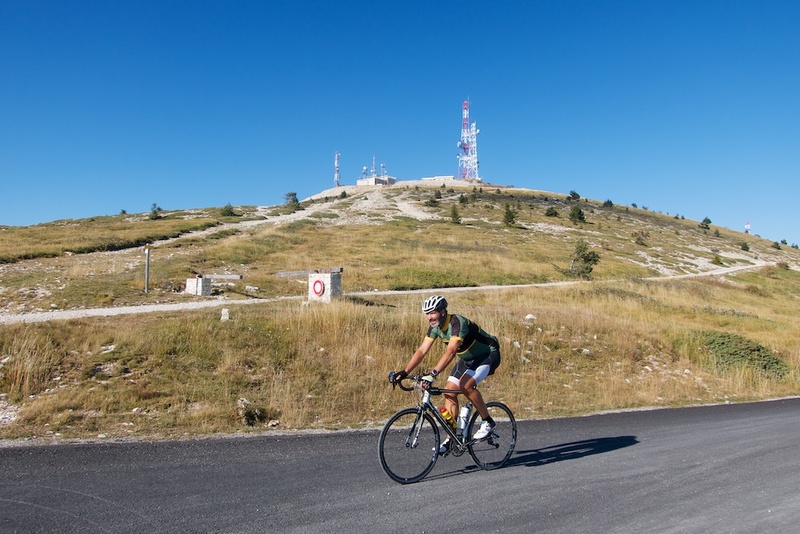 It’s sort of a mini-Ventoux with a big telecommunication tower at the top (it’s a rough, steep gravel climb to the tower). It’s a wide open area at the top. 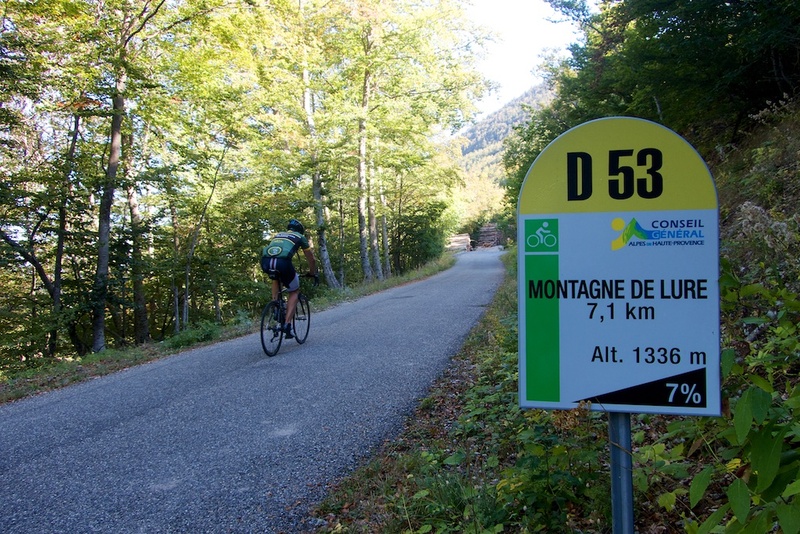 Perfect for a Tour de France finish one day? Again, this was just a quick ride to break up a long drive, so we took a team photo at the summit and keeping things simple, we descended back to the start. I highly recommend the habit of breaking up long drives with a bike ride. It stretches the legs and usually gives the opportunity to ride somewhere for the first time. This was fun. Hopefully one day I will visit the south side too. Great blog post. The cover photo is perfect! Will, where’s the map? That’s always the first thing that I look at before reading your posts. The Relive video is nice, but it’s not interactive and I can’t scan around to see where this climb is in relation to all of the other places. Thanks. Keep up the great work, I love all your posts! We cycled up that way from Sisteron and then down the other side to Pepin ayback to Sisteron making a good round trip. We did it that way round having been advised by a French man. The other side is less wiggly and had a good surface so we could enjoy the speed. 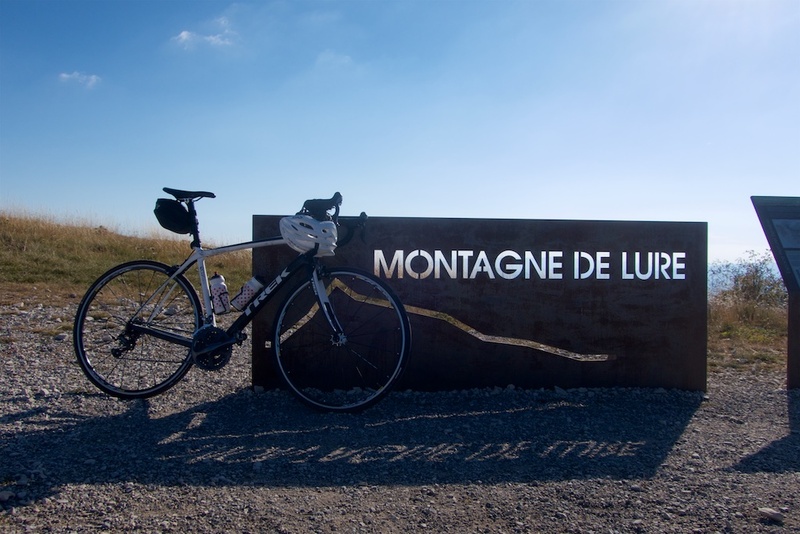 I’m from Australia, but was living nearby in Laragne-Montéglin for the first half of 2018 and got to ride both sides of Montagne de Lure.